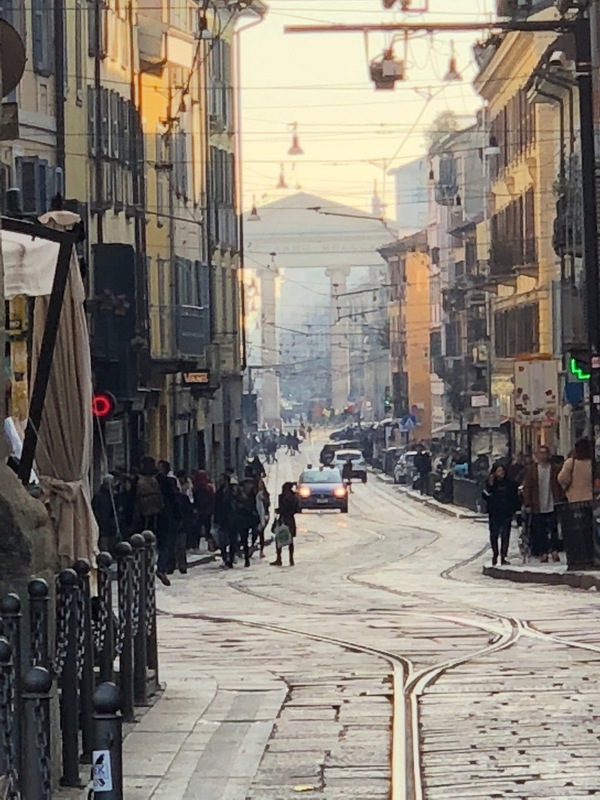 During January 2019 Robert Sakula was one of five visiting professors taking part in MIAW 2019 www.miaw.polimi.it/ a two week studio at the Politecnico di Milano. 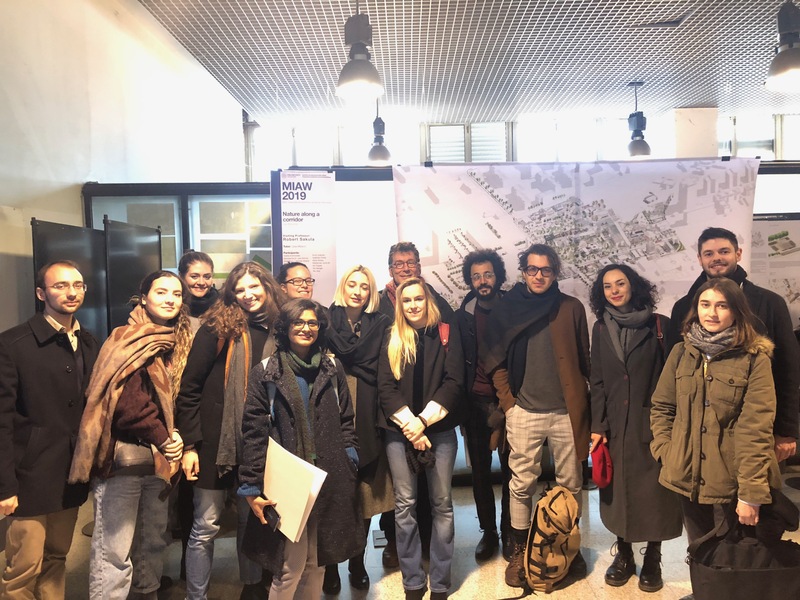 Working intensively with twenty six international students, Robert’s group investigated an alternative future for a peripheral suburb in the north east of Milan called Via Adriano. We aimed to turn it from a typical low-density, car-dominated suburb into a convivial neighbourhood with buildings set within an intensively cultivated productive landscape. Via Adriano is a place where driving dictates the timeframe, and cars are people’s main way to access work, school, services and goods. It is a landscape with an invisible history, at first glance a place measured by supersized pylons and industrial sized sheds. In the older part of the settlement, the narrow streets are choked with traffic which has killed off any pre-existing urban life. In the newer parts, by contrast, hundreds of thousands of square metres of empty space are given over to the occasional vehicle, while pedestrians huddle on the narrow sidewalks, and there is nowhere for cyclists to go. The lifestyle that goes with this landscape is unattractive. The low density of development precludes sustainable transport systems, and forces everyone to use cars for everything. This results in a condition of peripheral anonymity where it is normal not to know your neighbours, nor to encounter them in your daily round. Edges of cities – places like Via Adriano - have been doubly vulnerable to bombastic top-down planning seeking these kinds of uncomplicated stories, or timid mealy-mouthed versions of suburbia built for the car, while being comforted by old stories that no longer fit our age but hark back to old utopias like the Garden City. 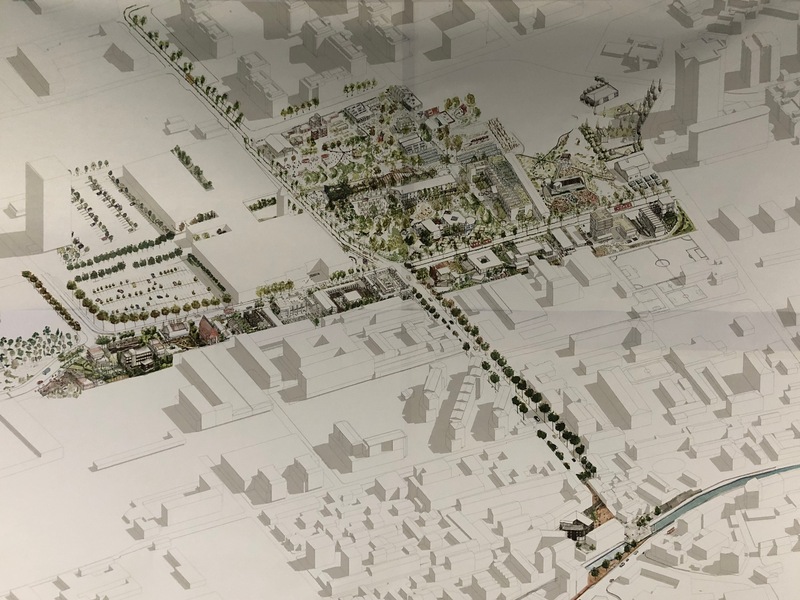 For our project, we invented an alternative future in the form of a radical incrementalism of small, community-focussed projects, making use of waste ground such as that under the pylons, and re-inhabiting disused buildings. Each student invented a ‘farmstead’ and the business of its occupants; a farmstead that is productive, driven by a particular ethos and ambition and open to the public for commerce, volunteering and relaxation. We ended up with twenty six different farmsteads laid out across a new, productive landscape inserted into voids in the existing suburban fabric where food is grown collectively and intensively in small plots. The farmsteads ranged from a brewery, an agricultural school, a chapel and a second-hand clothes emporium to an open-air theatre, co-working spaces and a plant library. All were small scale, collectively run, and community-owned. Each farmstead contained living accommodation for the proprietor or users. They were set within a continuously productive agricultural landscape, providing alternative food sources to the massive supermarket across the road, and providing opportunities for conviviality as people get together to grow their own food. We opened up new pedestrian desire lines, increased provision for cycling, integrated a new tramline and minimised or eliminated road space reserved for vehicles. The work of our group was initially fed by each student’s intensely personal architectural response to the brief, and the development of their farmstead and its surrounding landscape. Working as a group, students then brought together their projects to create a single image in the form of a bird’s eye view, showing a new urban model for the periphery where development is dense, intricate, small-scale and convivial, and where a productive landscape is as important – perhaps more important – than architecture. The collage that emerged is both a metaphor for a new edge city, and a form of briefing towards making it happen.